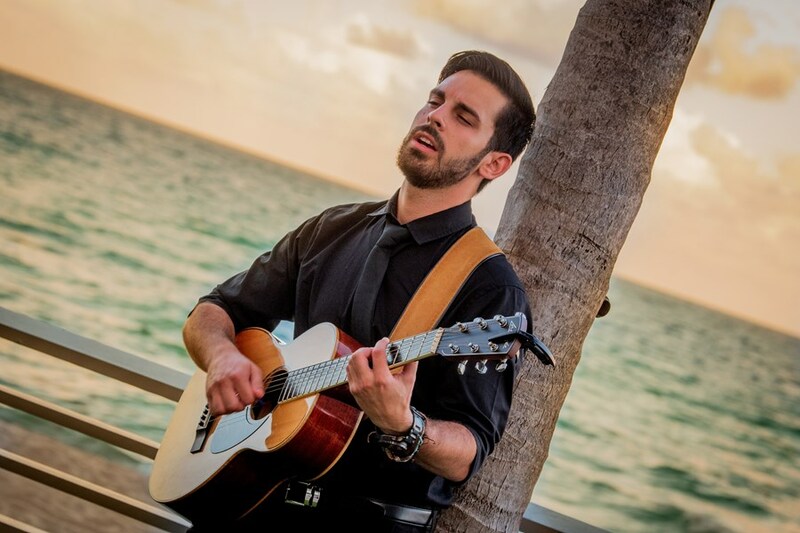 For nearly a decade, Joey Calderaio has entertained audiences in South Florida and across the U.S. at weddings, corporate events, and private parties, including special events for the Armed Forces. By blending together genres such as classic rock, reggae, funk, and pop, he creates a pleasing sound to an audience that everyone can relate to and enjoy. Joey is committed to making the night memorable by providing uplifting music whether you are looking for a variety of laid back tunes by the poolside or a source of upbeat dance music. Joey is available to perform as a solo or duo acoustic act as well as a 5-piece band called Jahzilla. 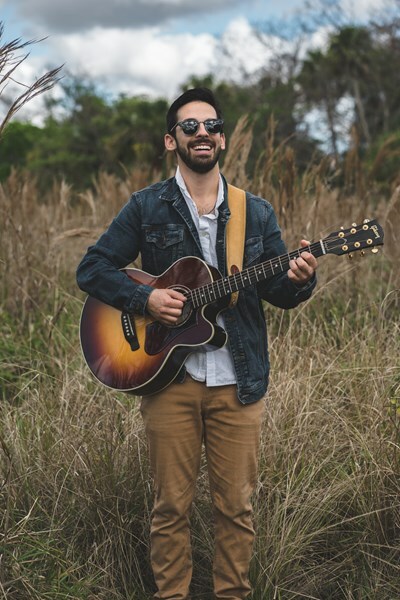 By singing, playing acoustic guitar, looping live guitar tracks, and using foot percussion, Joey is capable of establishing a large sound as if there are multiple musicians on stage. Check out Joey's audio and video links on his homepage! Joey was a pleasure to work with- so accommodating, so quick to respond when I had questions, always answered his phone, and good natured, willing, and cooperative. Everyone at the party thoroughly enjoyed his music, in fact, we couldn't get them off the dance floor when it was time for the party to be over! Highly recommend him! Joe was great. He was on time and set up all his equipment very professionally. Our party was a surprise 80th birthday party and he played just the right songs. All of our guests loved his performance. Joey and Alex played at our wedding last weekend and they were amazing!! It felt like every single guest told us how fantastic the music was. The piano/guitar combination along with their amazing vocals was the perfect choice for our event! We are so grateful to both of them for such a memorable experience. We would recommed them to anyone who looking to book entertainment guaranteed to impress their guests! Thank you for the kind words! We had an amazing time performing for you, your family, and friends. It was a beautiful wedding and we were glad to be a part of it! I am a huge music lover and I did a lot of research before I hired Joey and his band to play our wedding. Joey was quick to answer all my questions and concerns and was accommodating in every way. The variety of music was incredible and the band sounded like a million dollars. My guests were floored by the sound and commented over and over "Where did you find these guys"? One of my friends even said " We thought we were going to a wedding...but this was like going to a great concert." I will be forever grateful for their contribution to our wedding and I highly recommend them. Do yourself a favor, stop researching a band and hire these guys. They are flawless. Thanks Ian! We appreciate the feedback and would love to see you guys again soon. Thank you for the kind words! Our members had a blast! Joey is an outstanding performer! Everyone loved him. Thank you John! I had a nice time performing for your event! Joey was wonderful and worked with us very well. We were a little off on our timeline and he was very accommodating with that. Everyone loved Joey and we will defiantly be looking to use him for our future events!! Joey and Alex were perfect for our Bourbon and BBQ. Our guests loved it! We received many compliments and inquiries. They were fun, energetic, and kept us dancing into the wee hours. Great song selection too! They were very professional and talented. Highly recommend! Joey was the perfect musician for our event. He has a beautiful voice and was a lot of fun. He was able to read the crowd and adjust the set hit accordingly. He even stayed late after we extended our dinner party. I would highly recommend for any function! Joey was fabulous! He was reliable, professional and most importantly played the BEST music and made our party a complete success!!! Would totally book him again! Please note Joey Calderaio (solo/duo/band) will also travel to Riviera Beach, Lake Park, Palm Beach Gardens, Royal Palm Beach, North Palm Beach, Palm Beach, Lake Worth, Greenacres City, Jupiter, Lantana, Loxahatchee, Boynton Beach, Tequesta, Delray Beach, Hobe Sound, Boca Raton, Stuart, Port Salerno, Deerfield Beach, Pompano Beach, Palm City, Parkland, Canal Point, Bryant, Coral Springs, Lighthouse Point, Pahokee, Belle Glade, Coconut Creek, Jensen Beach.